"Just get a feed off the desk"
The independent film maker is likely at some point to need to film at a live event, whether it's a village hall pantomime, a folk concert, or maybe a corporate presentation. 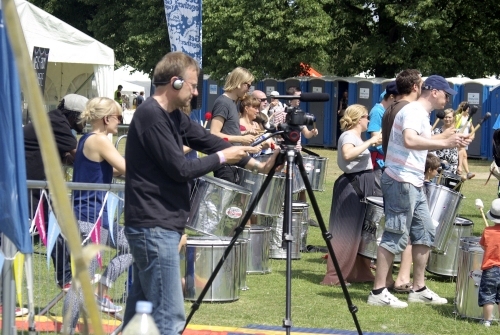 I've been official camera man at a fair number of live events. These include corporate training sessions and presentations, stand-up comedy and music gigs. The camera technique is now routine: a fixed camcorder at one side of the room, with me at the other side, on a video tripod, or a shoulder rig. Notwithstanding those hopefuls in the audience who are holding up their iPhones in the air, the best quality sound available will be that coming from the main PA. A rule of thumb in film-making is that the audience will put up with less than perfect pictures, as long as the sound is good. And whether you're doing it for a client or just for fun, the expectations these days are high. These days, the sound at the live event is probably close to perfect, so your film will be too, won't it? 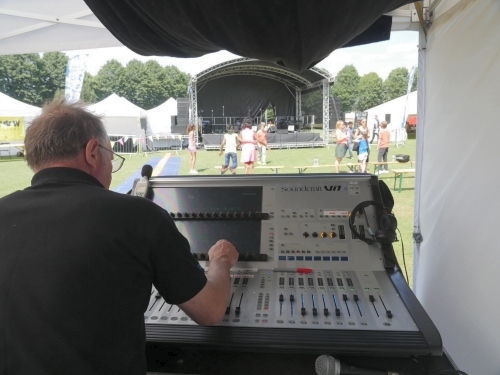 So you've explained to the event organiser that, no, the microphone in the camera won't really do, nor can you stick a mike in front of the PA.
What you really need is the main mix from the desk, the same signal in fact, as goes to the amplifiers. And he (she) says 'Sure, when you get here, just talk to the sound guy'. So what's to go wrong? At any significant live event, there will be a mixing desk, where all the sound sources are brought together. There are a huge number of models of desk, from dusty relics at the back of church halls with mechanical sliders, to fearsome digital monsters with programmable touch screens. This variety means you are unlikely to meet the same type twice. Be aware these desks do a lot more than mixing, and they have a wide variety of outputs, some of which will nearly do what you want. Even worse, at many small gigs, the sound guy himself may be meeting the desk for the first time. These desks allow the sound engineer to adjust levels (obviously), to bring in local sound sources such as a CD player, to preview feeds that are not active yet, to adjust equalisation (EQ), to create partial outputs based on particular groups of inputs, and to create any manner of local outputs at the desk itself. As an aside, this lets me bring in my favourite sound joke. How many sound engineers does it take to change a light bulb? Answer: one, two, one, two……. Let's talk through some of my real-life experiences. At a concert by Stackridge, I was filming with 2 cameras, and had a sound recorder connected to the mixing desk. With everyone under time pressure, or 'missing', there isn't much time to sort out problems or to do checks. So with 10 minutes to go, I finally got my Zoom digital recorder plugged in, and taking a feed from a headphone socket on the desk. Levels seemed ok, and I had to leave it to run to my camera position. Only when I got home did I find that the mix was…. weird. Terrible EQ, with different and fierce high frequency cuts on each channel. The spectrum analyser in Audacity was able to tell me what the HF cuts were, and I did my best to repair the damage by applying an opposite EQ in the editor, but it was far from ideal, and the noise quality suffered badly. Next, a comedy gig, a stand-up comedian with one mic and his sound effects box on stage. Not much to go wrong there, right? My recorder was plugged into the desk's auxiliary phono output, levels checked, all good. But, I didn't know that at the very end of the 90 minute gig, his final anecdote was played out to a background music track, fed in from a CD player on the desk. The sound engineer at the desk faded it up on cue, and rode the levels, to give the perfect audience experience. Unfortunately, my own experience was far from perfect. The CD player fed into my recorder mix at ear-splitting volume from the moment it was turned on. Clearly I was getting a pre-attenuated control mix, which utterly annihilated the audio from the stage. This was beyond remedy, and the last 10 minutes of the show was unusable. At a burlesque show, I had a similar experience, having checked all the levels INCLUDING background music. Only when I got home did I find that the mix included the sound guy cuing all of his music, starting and stopping CDs, and leaving background music running. None of this was apparent to the live audience, for whom the sound was just peachy. My signal on my digital recorder was so flaky as to be useless; I had to make use of the far less satisfactory camera microphone sound. 3 horror stories, fortunately amongst a much larger number of successes. What's to be done? If the desk has the inbuilt ability to record (and if the sound guy knows how to use it), grab the opportunity. It will be as good as or better than your recorder anyway. Explain patiently to the sound engineer exactly what you are doing and what you need. Remember he is not there to solve your problems - he has plenty of his own. The signal you REALLY need is the main PA feed, almost certainly coming out of the desk on a pair of XLR connectors. Equally certainly, you will not be allowed access to it. The engineer does not want to risk interfering with his main speaker feed and possibly wrecking the live sound. So, you will have to make do with an auxiliary output, or a headphone output, with all the potential for disaster I have described. It's hard to predict what connection you will be offered. I carry a small kit of adaptors with me. My small digital recorder (Zoom H1) has 3.5mm stereo input, so I carry cables for phono, 3.5mm and 1/4inch jack, as well as XLR. More sophisticated recorders can accept XLR inputs too. If you're getting a set of XLR adaptor cables, it is helpful to remember that the signal always comes OUT of the male pin. At the event, do, at the very least plan for a back-up. Put a stand-alone recorder near a main speaker, or if it's a speaking event, put your own microphone on the podium. Perhaps you can run an alternative signal into one of the cameras; even an external half-decent microphone on the camera hot shoe is better than nothing. Give yourself time to test everything, and most of all, get the sound guy on your side. Good luck and happy recording.